Practice Area: Lighted, grass tee driving range. Chipping green with sand bunker. Putting green. Description: As of 3/13/14, this course has officially closed. 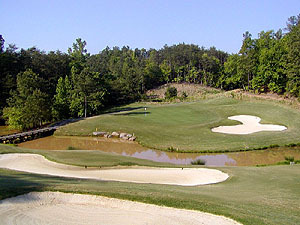 From the original description: This links-style course is conveniently located off I-485 in south Charlotte. 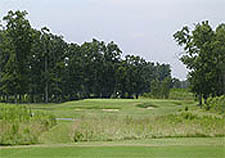 Many holes have rolling hills and creeks that bring water into play. There are 5 par 3 holes on this par 71 layout. B-Man's Take: Fun course to play with 4 par 5's and 5 par 3's. You'll score better here the more rounds you play. You need to know where the trouble is on each hole so you can avoid it. That means knowing when to hit driver or iron off the tee and where not to miss an approach shot. My favorite holes are #11 (because it's the only short par 3 of the 5) and #18, a reachable-in-2 par 5. This course has trouble on almost every hole in the form of bunkers or creeks. The hell-holes are the vicious 565-yd par 5 12th and the treacherously long 411yd dogleg right par 4 #17 with a row of British Open style pot bunkers guarding the dogleg. Like its sister courses in the Carolina Trail, this course is a bit pricey, but discounts abound. They sell a preferred player's card and usually have a coupon in the local paper. 3/23/14 - Charlotte Golf Links officially closed on 3/13/14. The owners of the land will likely re-develop it for commercial or residential use. 3/14/14 - Msg Board Posting by Cant3Putt titled "Charlotte Golf Links is done"
8/6/13 - Msg Board Posting by Wulfpack titled "More on Skybrook and Golf Links"
The Carolina Trail - Official site of Charlotte Golf Links' 4 sister courses.